Recently I was at a party where people were talking about a lot of random, light-hearted things. Someone mentioned guinea pigs. Someone else, who happened to be a scientist, pointed out that they aren't pigs, and they aren't from Guinea. One of his pet peeves was that "guinea pig" is used as a generic term for any creature being used in an experiment. "They have never been used in scientific experiments!" he insisted. "No, absolutely not!" Rats and mice are used as laboratory animals, he said, but not guinea pigs. Nobody knew where these non-pigs that aren't from Guinea got their name, or why they are referred to as the prototypical experimental subjects, so I began doing a little research. 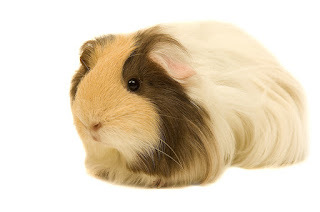 Guinea pigs, also call cavies, are rodents, like rabbits and mice. However, their plump, rounded bodies may seem to resemble tiny pigs. Further, the animals sometimes make little grunting noises that might sound a bit piglike. The "guinea" part of the name is harder to explain. These animals come from South America. Although some people speculate that the name might be a corruption of "Guyana," a country in South America, that's nowhere near the Andes, where the animals originated. We do know that in the early days of world exploration, Guinea was sometimes used in a generic way to refer to a distant, exotic destination, so it may be that these little creatures got the name just because they came to Europe from somewhere far away. What about the assertion that guinea pigs have never been used in scientific experiments? Well, the man at the party was a respected scientist, but he wasn't a biologist. While modern science institutions typically use specially bred rats and mice for experimentation, it seems that guinea pigs were used fairly often in the 18th and 19th centuries. For example, Nobel prize winner Emil von Behring used them, as well as rats and rabbits, in his research into serum therapy. In 1930, guinea pigs were used in the discovery of vitamin C. And as recently as 2006, guinea pigs were used in a study on the effects of green tea on smoker's lungs. Although the guinea pig name is a misnomer, no one is seriusly trying to change it. And even though it is now standard to use other kinds of rodents, the idea of guinea pigs in labs has become fixed in the public mind. The phrase isn't likely to drop out of common speech any time soon. My guinea pig eats like a pig, does that count? Huh, who knew? My sis had a guinea pig when we were kids. They are very cute. Yes, they are really cute pets. Thanks for your comment, Wendy.